There are two ways to look at TCPA compliance. TCPA compliance can be perceived as a problem because it creates unnecessary red tape, but the way you perceive it can lead to a positive outcome. 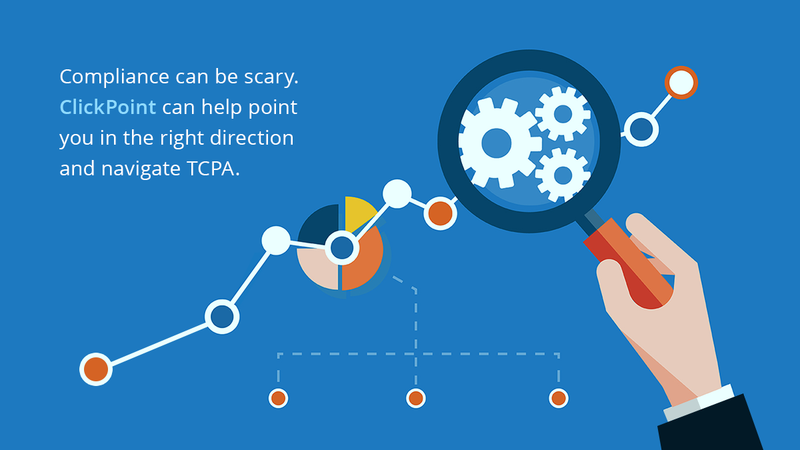 TCPA compliance can also be a positive because it helps to eliminate unfair practices and improves lead quality. The Federal Communications Commission (FCC) oversees the Telephone Consumer Protection Act (TCPA) which is the regulatory code for TCPA compliance. TCPA governs how companies communicate with consumers via text message, through your office phone system, calls to mobile devices, and prerecorded messages to landlines. When using software that contains any form of automated telephone dialing systems TCPA compliance must be taken seriously. There are precise rules when communicating commercial messages that your marketing team has to consider in order to remain compliant. Since October 2013 commercial messaging requires the recipient’s “express written consent”. In other words your website visitors and prospects need to put it in writing that you are approved to contact them via phone or text. For online marketers capturing consumer contact data through landing pages, this creates a need for solutions that enable both lead sellers and lead buyers to receive TCPA certified leads. Compliant leads are ones that are obtained via websites, web-forms, or by third party lead capture forms, in line with TCPA compliance rules. Here are 6 ways you to take control of TCPA compliance and use it as an advantage to provide higher quality leads. Ensures the correct TCPA consent text is present on landing pages and websites. Even if you don’t use a software solution it is easy to add this text to the submission part of your landing page or website. This is a must. Here is a sample: By providing <Your Company > with my cell phone number, I agree that <Your Company> may contact me on that number using an automated telephone dialing system. I understand that providing my cell phone number is not required to purchase <Your Company> services and that I may rescind this permission at any time. Consent must be provided and stored and you need to collect consumer intent prior to your sales team calling a prospect. You also need to specify that a consumer can be contacted by an automated dialing solution. Even if you collect this information and store it on your database you have to prove that the consumer did request to be called. Do you have this information stored on a database? The burden of proof lies with you and your company. If you can, you should capture time on site, pages visited, IP address, and confirm the consumer provided express consent by accepting the consent terms of service. You need to match the contact information with the analytic information so that their is sufficient evidence of the consumer requesting that you are clear to contact them. Another best practice is to capture the location of the IP address to reduce fraudulent submissions and to ensure the specified consumer did in-fact submit their information. You could get into a situation where the consumer says “I never filled out the form”. In this scenario the IP address and analytic information makes the case that they did indeed visit your site, request to be called, and you have an IP address to verify this. Can you easily print or download documents that contain consumer location, consent, IP address, time on site, and other data? You will need this to show consent was provided and verification is being stored in a secure location. If you follow the first five steps you have effectively created a more qualified lead. The potential customer has provided express consent and interest in your company, product, or service. You now have a prospect that has supplied a mobile number and consented to be called. Salespeople love qualified leads, while implementing the above steps sounds tedious there are tangible rewards. Improving lead quality is always a win for the sales team. Ultimately, a positive outlook can help you think about TCPA compliance in a way that is all about lead quality. Better lead quality can shift to improved sales performance, and reduced CPA (Cost Per Acquisition) for your leads. Better lead quality can also mean increased overall sales efficiency, by ensuring time and money are not wasted chasing down poor quality leads. This entry was posted in Sales Compliance on November 24, 2015 by Gabriel Buck.